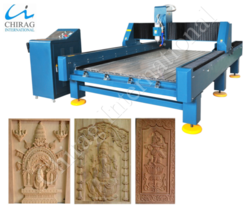 Our product range includes a wide range of 3d wood carving machine, wood router machine c14, cnc wood router machine, wood carving machine, cnc wood carving machine and wood engraving machine. 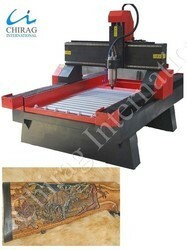 This machine is specially used for engrave Wood materials. It can engrave word and various graphic on the Wood. 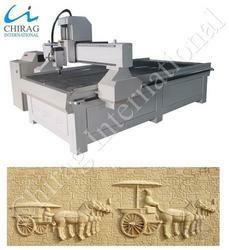 Also, it can be used for timber, density board and other non-metallic material and light metals as a wood cnc router. 1. The heavy-duty machine is welded with seamless steel structure, which is high temperature annealing and vibrating stress relief, so the lathe body is stabilized and will not be deformed forever. 2. Y axis adopts high precision helical rack and pinion with high denticity. 3. Well compatibility CAD/CAM designing software, such as type3/castmate/Artcam/wentai, etc. 4. This machine has the function of re-carving after break point or power failure and it can estimate the processing time. 5. Adopting advanced DSP system with USB interface, operate with the convenient handle, which will not take any computer resources. 6. Water proof and dustproof design for the CNC machine protects the transmission parts from broken. 7. For every set cnc Wood engraving machine three axes adopt Taiwan high precision square guide rail, X and Y axes adopt rack and pinion transmission, fast working, high efficiency and low cost; Z axis adopts Taiwan screw,with high precision and longevity. 8. Water tank and automatic water cooling system for cutters. 3. Well compatibility: CAD/CAM designing software, such as type3/castmate/Artcam/wentai, etc. 7. For every set cnc stone engraving machine three axes adopt Taiwan high precision square guide rail, X and Y axes adopt rack and pinion transmission, fast working, high efficiency and low cost; Z axis adopts Taiwan screw,with high precision and longevity. 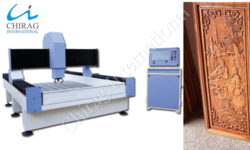 1.Main Introduction of 3 Axis Router CNC/CNC Wood Engraving Machine/ Wood Cutting Machine1325:With hard steel structure, the machine is fit for hard wood working, like cutting and engraving on rosewood for furniture, indoor decoration, and it is qualified for mass-producing of furniture with the vacuum holding way and dust collector. We use top quality components for the machine, such as HSD spindle, Delta Inverter, Becker Vacuum pump, Hiwin linear and so on, to keep the machine in best condition even after working for many years. 2.Top components of 3 Axis Router CNC/CNC Wood Engraving Machine/ Wood Cutting Machine1325:1)The machine’s body is strong, high-precision, reliable and durable.2)Imported high-precision ball screw, which moving smoothly, to ensure the machine’s high precision.3)Well-known HSD spindle, strong cutting ability, low noise, to ensure the machine working for long time.4)High-performance drive motor to ensure the machine’s high speed and accuracy.5)Perfect design, top quality accessories, to minimize the machine’s failure rate.6)Breakpoint specific memory to keep the carving status when power off, processing time forecast and other functions in case of the accidental power outages. 1.The machine body is made of welded thick steel pipe, high temperature processing to ensure the body deformation is small, rigid, and great strength.2.Y axis adopts two-motor drive, select matching to ensure smooth movement.3.Using high accurate rack and pinion drive, high precision and speed, great strength.4.Imported linear square guide way, high precision, big precision, big bearing redundancy, long life.5. With excellent mechanical design, select variety of electrical accessories carefully to minimize the failure rate.6.The machine is equipped with an automatic sink and water cooling system.7.All dustproof sand waterproof design, a full range of protection of the machinery transmission parts. Application:This series of models are mainly used for heavy weight of the WOOD,tile, bluestone,marble, granite, white marble, sandstone,such as a stone sculpture processing, category carved glass-cutting and engraving melting material. It is suitable for mass processing of foam,wood,MDF,Composite boards,wood,Alucobond,PVC,Rigid plastics,Acrylic Sheets,Organic glass,Aluminum plates and other materials. 1.Heavy seamless steel tube machine body, can load weight up to 1000kg, ensure machine stability.2.Machine transmission XY axis is rack pinion, Z axis is ball screw. this way guarantee machine high precision and long life time.3.3kw water cooled spindle, low noise, also not easy broken cutters.4.Famous Taiwan HIWIN 20mm line square guide rail, ensuring the higher precision and long life time.5.Rich Auto DSP controller system, offline operation, not need connect with computer, very easy and convenient.6.Adopt high speed step motors and lead shine drivers, and two motors for Y-axis. Max speed is 50M/MN.7.Two sides water cooling system, reduce cutters temperature when machine working.8.Three axis all have the water proof and dust proof system. 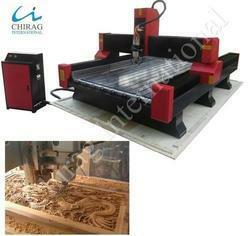 Looking for “CNC Wood Router Machine”?